‘Story Mode’ adds a ton of variety by introducing physics based contraptions for the first time ever. 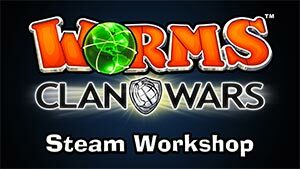 A plethora of interesting machinery spices up the gameplay, and makes solo Worms™ much more fun! The single‐player game isn’t only about dealing death and destruction, it’s also about negotiating tricky swinging rope bridges, rescuing friendlies from death defying traps and defeating mech-suit wearing enemies! The player spends much more time playing, and much less time waiting for their A.I. opponent to take a shot. Fancy yourself as the artistic type? Steam Workshop integration allows you to get creative! Now you can make your worms wear exactly the outfits that you want them to. Import your own 3D objects and textures into the game using a separate tool. You can model hats, glasses, moustaches, trinkets and gravestones for your worms. Design death-match levels, craft single-player missions and even record your own speech-banks too. Proud of your creations? You can share them online, thanks to Steam Workshop!